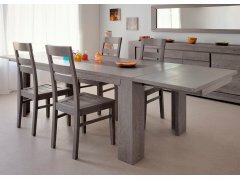 The RoomSmart Titan Dining Room Furniture Collection combines the elegance of slate gray solid oak, durable oak veneers and silkscreened-glass inserts with the ability to create a big, dramatic look in any size dining space. You can choose between a smaller square dining table, and a larger rectangular one with optional extensions. There are both 3 and 4 door sidebars and a glass-door cabinet for storage options. Beautiful solid oak chairs perfectly match, creating a stunning mono-chromatic look in your dining space. Matching living room pieces are available, so your open-area great room furniture is compatible. Whether you live in a large home with private dining area, an open loft, or a small-scale condo, the Titan Collection can adapt to your needs. 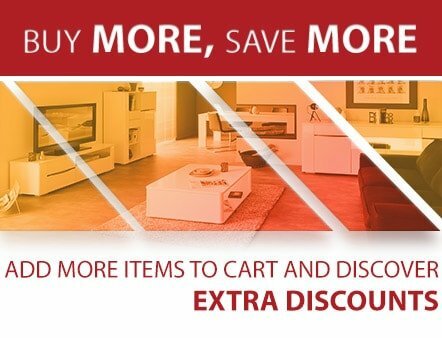 The Parisot Company, manufacturing eco-friendly furniture for over 79 years, cleverly combines the beauty of fine furniture with the practicality of creating storage and arrangements within smaller living spaces. Fine Craftsmanship-Practical Solutions-RoomSmart!